We are just back from the International Pinot Noir Celebration in McMinnville, Oregon — what a great event! I’ll be writing about some of the things I learned in the coming weeks, but I thought I’d use this opportunity to tell you what I said there. I told the class about the forces of globalization and branded wine (the Curse of the Blue Nun and the Miracle of Two Buck Chuck) that I discuss in my book Wine Wars and then I expressed my faith that the Terroirist in all of us would preserve wine’s soul. (If you have attended one of my book talks, you will have some idea of what I had to say.) Then I turned my attention to Pinot Noir. 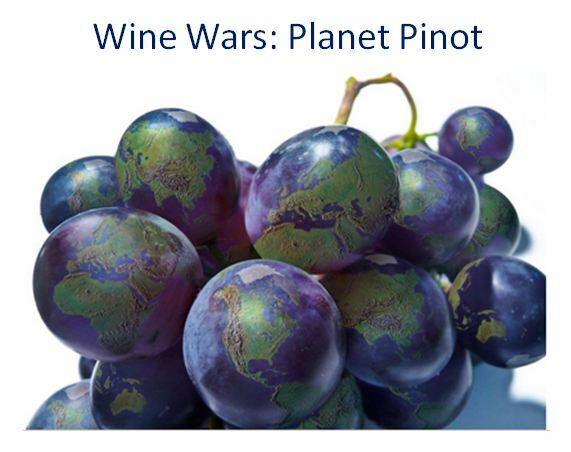 Pinot Noir is a great Wine Wars case study. It is one of the great global wine grapes. It ranks #7 on this list of the ten most planted red wine grape varities, for example, ahead of Bobal and right behind Carignan. 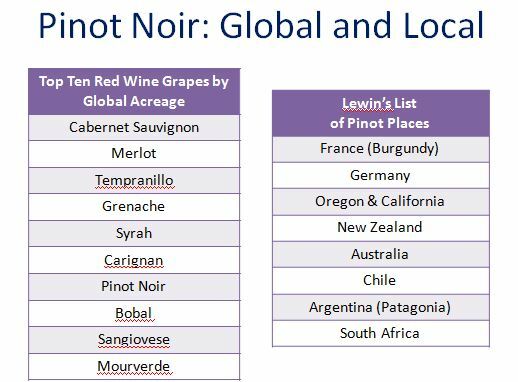 You cannot find Pinot Noir everywhere, but in fact its domain is quite large. So all the good and bad things that happen to global wine necessarily happen to Pinot, too. But Pinot is also incredibly local. In Benjamin Lewin’s excellent book In Search of Pinot Noir, he seeks out exceptional Pinot and finds it in only a handful of places. Pinot Noir is the third most planted wine grape variety in Germany, for example, but exceptional Pinot happens only in a few valleys up North. South Africa is too hot for Pinot for the most part, but there are a few tiny niches where cold winds from the ocean currents blow in to keep Pinot alive. I was speaking in Oregon, of course, so all the students had to do is look up to the nearby hills to understand my point. 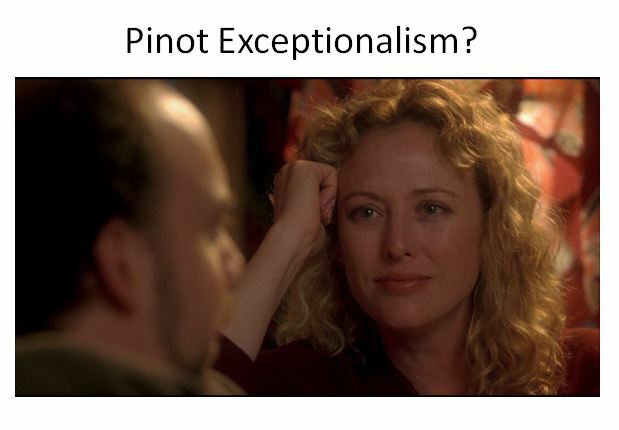 Exceptional Pinot is a creature of tiny terroirist niches. I frequently use videos in my class on The Idea of Wine at the University of Puget Sound, so I drew upon related images for my next points. Because Pinot is such a particular thing, a certain idea of Pinot Exceptionalism exists. Pinot is different — not ubiquitous like Merlot and Cab, no subject to the same vulgaries as other wines. 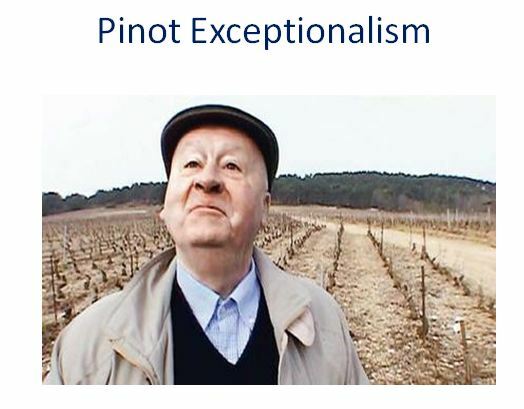 Some of the exceptionalism comes from producers (like Burgundy’s Hubert de Montille seen here in a scene from the documenary Mondovino). They see Pinot’s exceptionalism rising from the terroir itself, inspired by the finely delineated viticultural geography of Burgundy. I find that many Pinot producers feel the same way. I am no longer surprised when I see finely detailed maps of Burgundy vineyards displayed like small shrines on the walls of Pinot growers around the world. Miles: I don’t know. It’s a hard grape to grow. As you know. It’s thin-skinned, temperamental, ripens early. It’s not a survivor like Cabernet that can grow anywhere and thrive even when neglected. Pinot needs constant care and attention and in fact can only grow in specific little tucked-away corners of the world. And only the most patient and nurturing growers can do it really, can tap into Pinot’s most fragile, delicate qualities. Only when someone has taken the time to truly understand its potential can Pinot be coaxed into its fullest expression. And when that happens, its flavors are the most haunting and brilliant and subtle and thrilling and ancient on the planet. Miles is really talking about himself of course — he simply projects his dreams and insecurities onto Pinot Noir.Exceptional Pinot is not all the same, it is individualistic, and this allows us to identify with it and through it as Miles does here. The fact of Pinot Exceptionalism draws us to this wine, but we should never think that we are immune from the Wine Wars battles. Ironically, it was Sideways that triggered a global Pinot boom, with all the pluses and minuses. 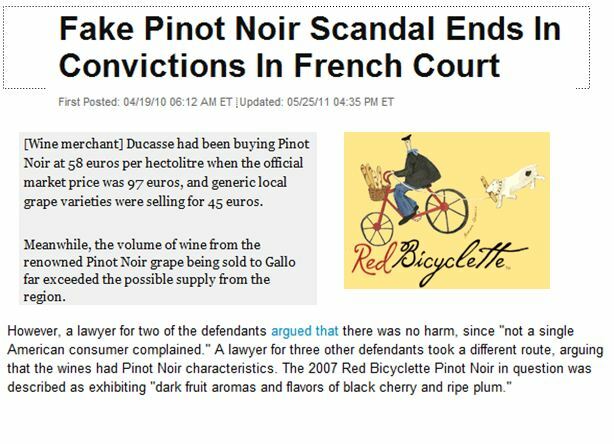 The French Pinot scandal — thousands of liters of fake Pinot Noir were sold to U.S. buyers — indicates that Pinot People cannot take their exceptional status for granted. Note my favorite line: no American complained. Ouch! I count on the terroirists to save the day, of course, but they face what economists call the Collective Action problem. How can you get them to work together? They are by definition individualists and they can be pretty opinionated, as this exchange from a video by Jancis Robinson illustrates. Jancis was visited Domaine Leroy in Burgundy, tasting with Lalou Bize-Leroy herself down in the cellar. After marveling at Lalou’s wonderful wine, she pulled out a bottle of Oregon Pinot and offered up a glass. Lalou sniffed, sipped and spat! It is OK wine, she said, technically sound. But it has no soul. Oregon mustn’t make Pinot, she said. They should make something else that is more suitable to their terroir. [And leave Pinot to our terrrior here in Burgundy, I suppose). An understandable attitude, but hardly a way to organize a critical terroirist mass. Later in the same video one of the Oregon Pinot Pioneers makes a similar assessment about Pinot in California. Ouch! Rather than presenting a unified front, terroirists sometimes seem to be their own (and each other’s) worst enemies. Benjamin Lewin notes a different terroirist trouble in his book. Many American Pinot makers are so obsessed with expressing micro-terroir that they undermine their region’s reputation. They make many tiny production micro-terroir wines that are so scarce that they almost do not exist because basically no one can taste them. These invisible wines may be grand cru quality, but who but a lucky few insiders will ever know? Meanwhile the more widely available wines are only village quality at best in terms the Burgundian reference, according to Lewin. Maybe Lalou’s reaction to Jancis’s Oregon Pinot can be understood in this context. If this wine (which tastes like a village wine) is the best Oregon can do, perhaps they should try something else. So this is why IPNC is so important. Not [just] because it is so much fun or because it is such a sensuous delight. And not just because of all the great people who make it happen. IPNC’s magic s that it brings terroirists together in the spirit of shared pleasure and mission. 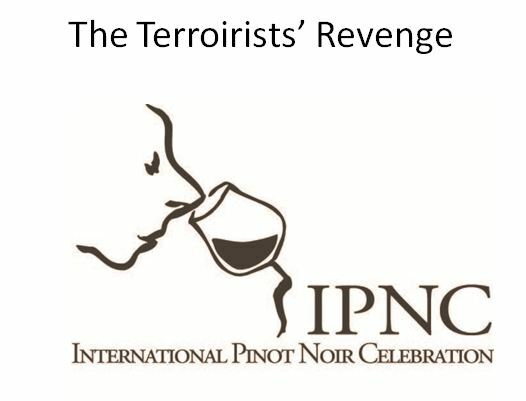 If the terroirists’ revenge is to happen, it will be because of the common purpose and spirit that gatherings like IPNC foster. Thanks to the folks at IPNC for inviting us to participate in the University of Pinot. Thanks to our friends Susan and Scott Chambers for letting us beta-test their Davis Street Bungalow in McMinneville — perfect location for IPNC or Oregon wine tourism. Too much blather, not enough information. “It is OK wine. Technically sound. But it has no soul. 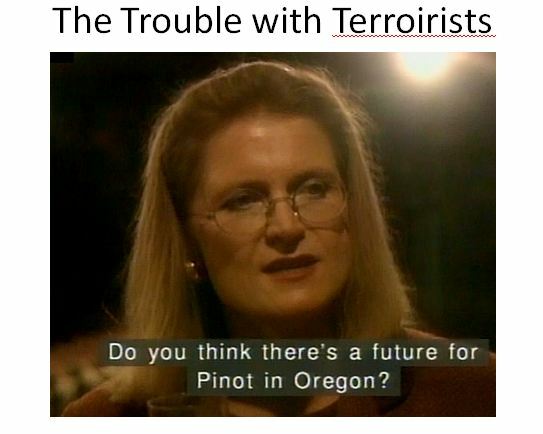 Oregon mustn’t make Pinot. They should make something else that is more suitable to their terroir. I saw no quotes around it. I ask because if it is truly an accurate quote then we have one more example of the degeneration of the French wine trade: Many are simply uneducated about anything but their own country’s wines. That’s a paraphrase of what she said, Tom (hence no quotes) but it’s an accurate summary. The first part of the video is on YouTube, but it doesn’t include the Lalou interview. Mike, it’s hard to know what else to attribute this kind of attitude on the part of Mme Lalou other than real ignorance. And it’s very disappointing. Agreed, Tom. But let me say that the video is a few years old, so perhaps her opinion has changed. My point in using it was just to indicate that terroirists can sometimes be so territorial that it makes it hard to them to work together. Agreed. 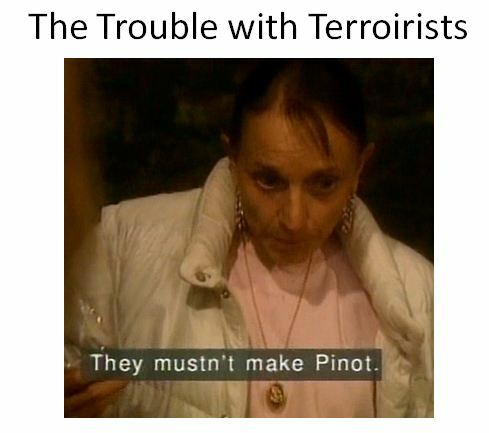 The Jancis Robinson videos were made in the 1990s. You made me smile, Peter. Thanks! Did “Sideways” cause the upswing in PN, or all the mindless blather by TV reporters desperate to talk about “Sideways” and it’s influence on PN? It did OK ($71million US Gross), but let’s face it, it wasn’t that good of a movie! Some pinot noir is so good because of the petit syrah that was added into it. I am not saying that all winemakers do this. I have seen and tasted pinot that was mysteriously darker in color and had a hint of elderberry in it. LOL. Yes it came from a very big wine maker and was a popular item for a while. The French are pretty much going to agree that Burgundy makes the best PN. People have a tendancy to have vested interests. Trying to limit the possible quality of a particular wine cannot be limited by one factor. It takes many factors. Including skill and art. An interesting thing about Pinot Noir is that there is no family of blending varieties. So a good Pinot typically depends upon a single vinyard for success. I have always suspected some great marketer/vintner will find the cultivars of Pinot and other grapes which will produce a light red blend with much or most of the qualities of a good Pinot Noir. The test as always will be true blind tastings. Terroir will suffer yet another erosion (my suspicion is that it is shorthand for a few other qualities vintners could list). Not that I am know about. I think there may be snippets on youtube.